If you were a kid in the 1960s or 1970s and didn't get homemade Halloween costumes, you probably wore one of the Ben Cooper Halloween costumes at some point. These campy costumes with hard plastic masks and plastic bodies reminiscent of a garbage bag were all the rage back then because they were mass produced and cheap. These days costumes are of much better quality, but it's still fun to look back at the horror of these outfits. 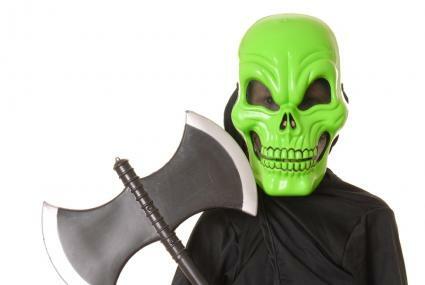 Ben Cooper was one of the biggest brands of mass-produced Halloween costumes in the 1950s, '60s and '70s, but the company was still making costumes into the 1990s. Jeannie from "I Dream of Jeannie"
Mork from "Mork and Mindy"
There are also some more general costumes available such as a fairy, vampire, mummy, clown, leopard, astronaut, pirate or teddy bear. These costumes run the whole range from things you might still want to wear to things that are best left in the past. It's likely you wouldn't want to wear Ben Cooper Halloween costumes these days. The ones you can find were either previously worn, which may mean they aren't complete or aren't in good condition, or they are still in the package, which means you might not want to open them if you're planning a collection. On the other hand, you can find some great Ben Cooper masks without the rest of the costume. Most of these cost just a couple of bucks on eBay (you can also find them on other auction sites, and sometimes even at flea markets or swap meets) and add a fun, campy element to a costume on the cheap. Even if you don't wear a costume on your body, you'll be the hit of the right kind of Halloween party when you come in sporting a Voltron mask. Or you can add a simple costume to make yourself a mad scientist (lab coat), Medusa (toga), the devil (red sweatsuit), or a pirate (loose shirt and tight pants). One of the good things about starting a Ben Cooper collection is that it can be relatively inexpensive. For some of the more recently made costumes, you'll pay $5 or $10, even to get one that's still in the box. If you become a serious collector, though, you will end up shelling out some cash. There are people out there willing to sell vintage costumes such as the famous 1965 Ben Cooper Spider-Man, but you'll pay $50 to $100 and up, depending on who is bidding that day. Some people are offering costumes and want up to $300 for them, depending on the character and how rare it is considered to be. Ben Cooper costumes are a lot of fun, whether you're buying them as a trip down memory lane, a costume to wear or a keepsake to collect. Either way, you and your friends are sure to enjoy spending time with these costumes.